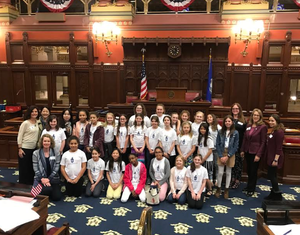 Parents and interested others are invited to learn about Ms President US, a girls' civic leadership program held in Ridgefield CT. Girls entering 4th to 8th grade are welcome to enroll as participants, and high school age girls with leadership experience are encouraged to apply to be Mentors. The Parent Orientation will take place from 6 to 7pm on Tuesday August 28th in the Dayton Program Room of The Ridgefield Library (472 Main Street, Ridgefield CT).